"Overnight sensation" is not a description that applies to Deerhoof. They date from 1995 and have regularly changed personnel around the core of Greg Saunier and Satoni Matsuzaki. They also share history and content likenesses with the bands Enon and Blonde Redhead, beyond the obvious female Japanese vocalist congruence. Proving that bands, like buses, actually do come in threes. Deerhoof hit their stride in 2003 with the cult hit 'Apple O’' and followed up rapidly with the excellent 'Milk Man' album. 'The Runners Four' (2005) and 'Friend Opportunity' (2007) followed and took the band in a divergent – less garage, more electronica - but equally well-received direction. They toured extensively and have opened for a veritable who’s who of alternative music, even Radiohead. 'Deerhoof vs. Evil' is their first album in a while and for those, like me, who prefer their more unfettered output, represents a really positive evolution. It’s packed with marvellous songs and feels like a greatest hits album composed entirely of new songs. This sense of retrospective comes out of a mix of styles and sounds from the relative and appealing simplicity of 'Behold A Marvel In The Darkness' and 'I Did Crimes For You' to the fuzzed out 'The Merry Barracks' to the syncopated trance of 'Super Duper Rescue Heads!' and 'Almost Everyone, Almost Always'. It’s almost all good, apart from 'C’Moon' which isn’t exactly their strongest song ever. Listening to the album constantly recalls moments from the band’s back catalogue without seeming in the least tired or lacking invention. In fact, the album demonstrates just what a great band Deerhoof really are – maturity in absolutely the best sense of the word, and after hearing it through a few times, I couldn’t wait to go back and revisit their other albums too. 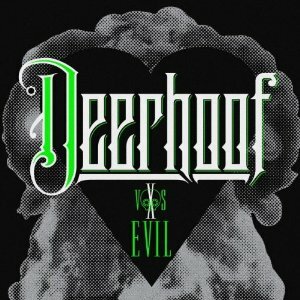 Accomplished, inventive, original, melodic music is a hard trick to pull off, and 'Deerhoof vs. Evil' is testimony to the fact that practice indeed makes perfect. A fascinating and highly recommended piece of work. Purchase 'Deerhoof vs. Evil' from amazon.co.uk or amazon.com.